We used to call Rosogolla as Sada misti which means white sweet and gaint sada misti used to call Rosogolla (I even had Tennis ball size Rosogolla which is impossible to find now). I gave Rosogolla recipe before which makes perfect rosogolla. But this rosogolla is with less ingredients . 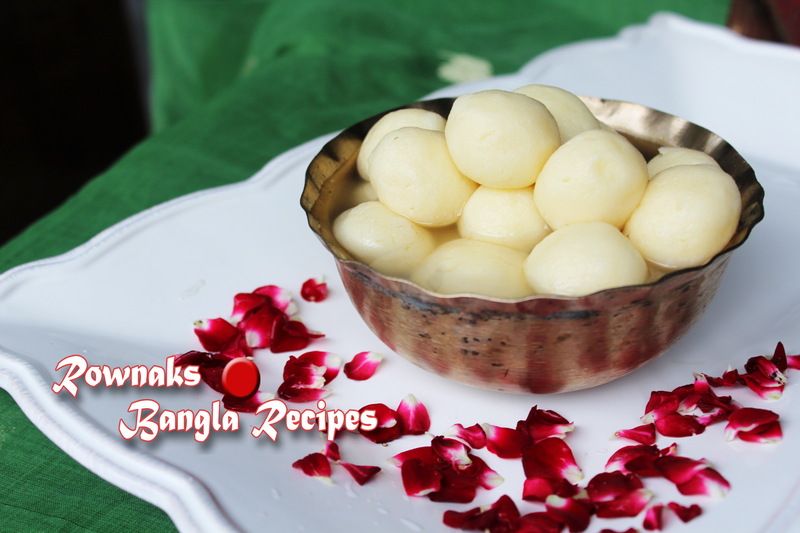 So please check my childhood favourite Rosogolla / Sada Misti / Sweet Cheese Ball. N.B. if you want, you add cardamom powder with chana. Check my chana recipe to make chana from milk and vinegar (personally I never use lemon juice, but some prefers to use lemon juice). After making chana place it into a strain to drain whey (water), you need to bring it to room temperature quick (add some ice or place under running tap). Squeeze or strain the water from chan. We don’t need any excess water in chana. Knead it with plain flour and baking powder for 5-8 minutes (I prefer food processor for kneading) and divide into 25 equal parts. Shape into round ball . When you start giving shape of your rosogollo, start boiling sugar and 5 cups of water together in a large sauce with lid(make it large to hold rosogolla, it will be double in size after boiling). When sugar dissolves and comes to boiling point, add rosogolla and boil in syrup for 15 minutes for under closed lid on medium heat. Add ¼ cup lukewarm water in your boiling syrup and cook 10 minutes more minutes under closed lid. Add ¼ cup lukewarm water and cook 10 minutes more. So altogether we are boiling Rosogolla for 35 minutes on medium heat. Check Rosogolla after 30 minutes, to check rosogolla , take out 1 rosogolla from syrup and cut into half , if inside of rosogalla is same colour, you can turn off the heat. If middle of rosogolla is different colour (white) , that means it is still raw and need more cooking. Turn off the heat, add ¼ cup lukewarm water in syrup and let it cool down. 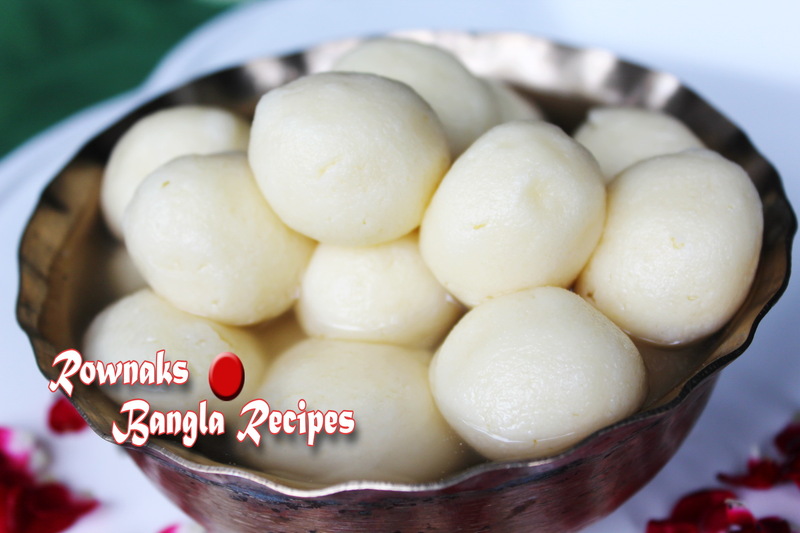 Enjoy yummy Rosogolla(my sada misti). 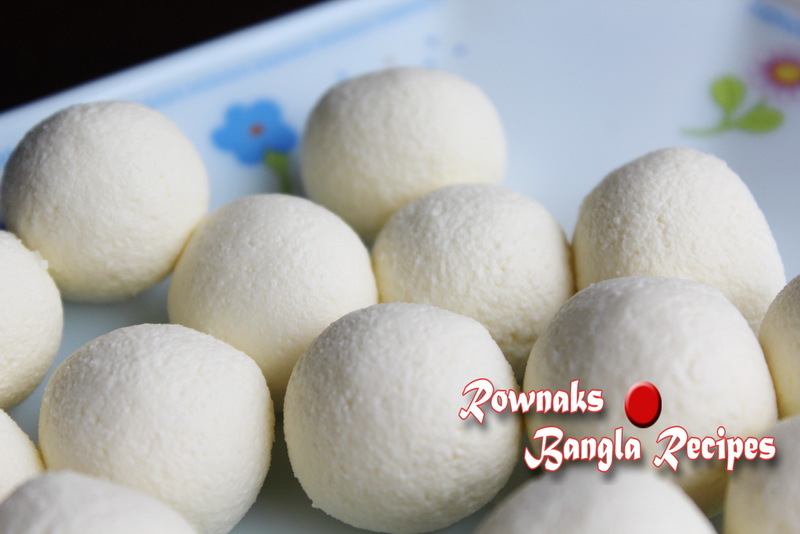 Rosogolla is one of the favourite food in bangladesh. All we have the taste of it but i didn’t how to cook this delicious as it is one of my favourite sweet dish. I learn from here how to make rosogolla. Many thanks for you to give the opportunity to learn how to cook this delicious dish. Hi.. Thanks for the recipe ..taste real good .. But rosgolla got cracked .. Any idea why? 1/6 tea spoon is really unusual measurement.. Do u have any idea to convert ? ami rosogolla banale bitore ros doke na cano bolte paren koy pls. rosogolla sokto hoy take.